I’m a satisfied user of Lucion’s FileCenter software and have been for several years now. One of the things I like about it and the main reason I use it, I guess, is the ability to automatically name files that I’ve scanned, based on whatever criteria you choose. 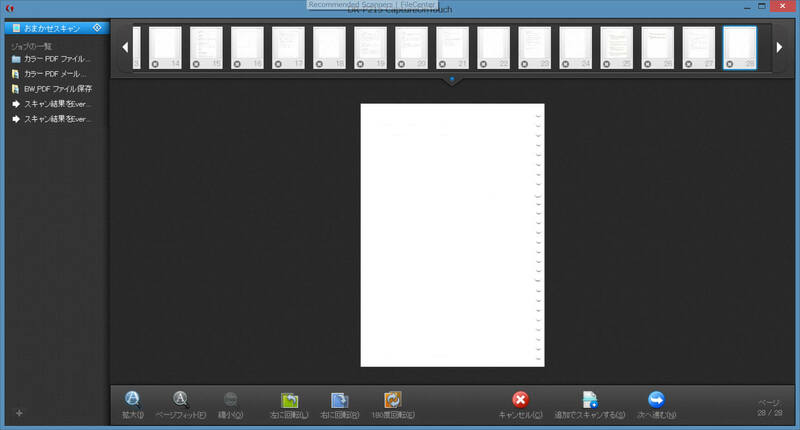 I have FileCenter name my file based on the location of the file. ScanSnap scanner I have, it doesn’t stop automatically when it’s taken in more sheets than it can scan. OK, here’s a run-through of how I use FileCenter. 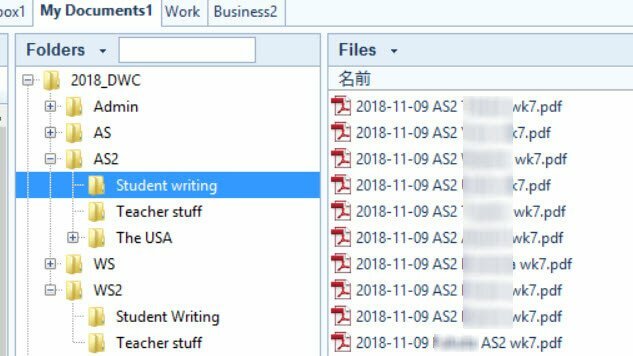 Here’s a screenshot of one of my work folders for a school I teach at: under the “Folders” column, you can see I’ve selected the “Student Writing” folder which is nested inside the “AS2” folder inside the 2018_DWC folder. FileCenter will also do cool things like separate pages into different folders. This can be useful, tho it takes time to setup and I haven’t done it for a while. I teach and, as I need to give each student a grade at the end of the semester, it’s useful to have all a student’s work all together in his or her unique folder. But when I collect students’ work at the end of each class, the papers are not in order and of course they’re all together. I scan the lot without separating usually, but if I want to separate them (and it’s much easier to do this BEFORE you scan than after – it’s still possible but that’s a matter for another blog post), I need to add a special blank page with identifying information for FileCenter to read. This page is called a (wait for it…) SEPARATOR! and it goes in front of the student’s hand-written scrawl carefully written classwork, and it should be the same size as the student’s paper (mine usually use B5 loose leaf). When you’ve added the separators, you cram all those papers into your scanner and hey presto! FileCenter should name them and send each student’s papers as PDFs into each student’s folder on your hard drive. There is not a single multifunction machine that we will recommend. and I have found that to be the case, even tho my all-in-one thingy is a Canon. See the whole article. Brooks Duncan of DocumentSnap taught me how to go paperless, and recommended ScanSnap, then went wittering on about a Mac-only piece of wunder-software called Hazel which sliced and diced and tucked you up in bed at night with a hot chocolate (or nearly), but the closest I could find for Windows was FileCenter, which is not at all bad, tho quite expensive and probably qualifies as bloat-ware as it has tons of functions I never use. Brooks recently blogged about DropIt, a Windows program that will do some of the things that Hazel does, apparently. I don’t think I’ll bother (I remember the frustrations I had with trying to get FileJuggler to work for me) but you’re welcome to give it a whirl. « Where did you go today?